The Vickers hardness test was developed in 1921 by Robert L. Smith and George E. Sandland at Vickers Ltd as an alternative to the Brinell method to measure the hardness of materials. The Vickers test is often easier to use than other hardness tests since the required calculations are independent of the size of the indenter, and the indenter can be used for all materials irrespective of hardness. The basic principle, as with all common measures of hardness, is to observe a material's ability to resist plastic deformation from a standard source. The Vickers test can be used for all metals and has one of the widest scales among hardness tests. The unit of hardness given by the test is known as the Vickers Pyramid Number (HV) or Diamond Pyramid Hardness (DPH). The hardness number can be converted into units of pascals, but should not be confused with pressure, which uses the same units. The hardness number is determined by the load over the surface area of the indentation and not the area normal to the force, and is therefore not pressure. The pyramidal diamond indenter of a Vickers hardness tester. An indentation left in case-hardened steel after a Vickers hardness test. The difference in length of both diagonals and the illumination gradient, are both classic indications of an out-of-level sample. This is not a good indentation. It was decided that the indenter shape should be capable of producing geometrically similar impressions, irrespective of size; the impression should have well-defined points of measurement; and the indenter should have high resistance to self-deformation. 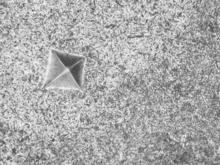 A diamond in the form of a square-based pyramid satisfied these conditions. It had been established that the ideal size of a Brinell impression was ​3⁄8 of the ball diameter. As two tangents to the circle at the ends of a chord 3d/8 long intersect at 136°, it was decided to use this as the included angle between plane faces of the indenter tip. This gives an angle from each face normal to the horizontal plane normal of 22° on each side. The angle was varied experimentally and it was found that the hardness value obtained on a homogeneous piece of material remained constant, irrespective of load. Accordingly, loads of various magnitudes are applied to a flat surface, depending on the hardness of the material to be measured. The HV number is then determined by the ratio F/A, where F is the force applied to the diamond in kilograms-force and A is the surface area of the resulting indentation in square millimeters. A can be determined by the formula. where F is in kgf and d is in millimeters. where F is in N and d is in millimeters. A common error is that the above formula to calculate the HV number does not result in a number with the unit Newton per square millimeter (N/mm2), but results directly in the Vickers hardness number (usually given without units), which is in fact kilograms-force per square millimeter (kgf/mm²). To convert the Vickers hardness number to SI units the hardness number in kilograms-force per square millimeter (kgf/mm²) has to be multiplied with the standard gravity (9.806 65) to get the hardness in MPa (N/mm²) and furthermore divided by 1000 to get the hardness in GPa. 30 indicates the load used in kgf. Vickers values are generally independent of the test force: they will come out the same for 500 gf and 50 kgf, as long as the force is at least 200 gf. When doing the hardness tests the minimum distance between indentations and the distance from the indentation to the edge of the specimen must be taken into account to avoid interaction between the work-hardened regions and effects of the edge. These minimum distances are different for ISO 6507-1 and ASTM E384 standards. If HV is expressed in kgf/mm2 then the tensile strength (in MPa) of the material can be approximated as σu ≈ HV×c ≈ HV/0.3, where c is a constant determined by yield strength, Poisson's ratio, work-hardening exponent and geometrical factors - usually ranging between 2 and 4.. In other words, if HV is expressed in N/mm2 (i.e. in MPa) then the tensile strength (in MPa) ≈ HV/3. This empirical law depends variably on the work-hardening behavior of the material. 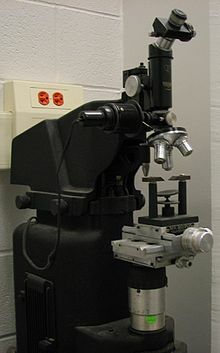 ^ The Vickers Hardness Testing Machine. UKcalibrations.co.uk. Retrieved on 2016-06-03. ^ Vickers Test. Instron website. ^ Zhang, P. (September 2011). "General relationship between strength and hardness". Materials Science and Engineering A. 529: 62. doi:10.1016/j.msea.2011.08.061. ^ Report on the Convair 340/580 LN-PAA aircraft accident North of Hirtshals, Denmark on September 8, 1989 | aibn. Aibn.no. Retrieved on 2016-06-03. Meyers and Chawla (1999). "Section 3.8". Mechanical Behavior of Materials. Prentice Hall, Inc.